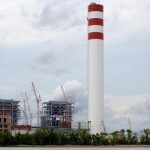 2100 MW new coal fired power station in Malaysia uses Pennguard lined steel chimney flues downstream of its FGD systems. With its growing economy and a population that is expected to reach 29 million in 2010, Malaysia is experiencing a continuous, strong increase in its electrical power consumption. To keep up with electricity demand, the Malaysian government has allowed private investors to develop several large power stations. The largest of these is the 3 x 700 MW Tanjung Bin Power Station in the state of Johor, in the southwest of the Malaysian peninsula. Before the construction of Tanjung Bin Power Station could even start, the owner had to perform great improvements to its 70 hectare piece of land. To improve on the swamplike conditions, he used some 6 million cubic metres of sand. A further 2.3 million cubic metres of clay were removed to create an 18 m deep harbor for bulk carriers bringing in imported coal. Throughout design and construction, the owner was supported by German engineering company Fichtner. The construction of the three 700 MW power units was undertaken by a consortium under Sumitomo and Malaysian company Zelan for all civil works; turbine, boilers and related electrical and mechanical balance of plant were supplied by Toshiba and IHI. 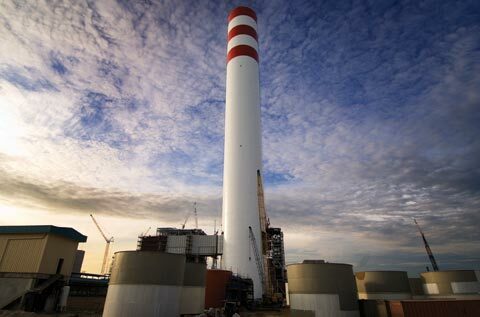 The 700 MW units of Tanjung Bin Power Station are equipped with a Sea Water FGD system to allow the station to fire a range of coals while observing the Malaysion emmisions limit for sulphur dioxide. When coal with a moderate sulphur content is fired, about 60 % of the gas stream passes through the FGD system and the flue gas exit temperature is 75-80 °C. However, when low sulphur coal is available, the operator has the option to fully bypass the FGD system. In that case, the flue gas exit temperature is 135-140 °C. 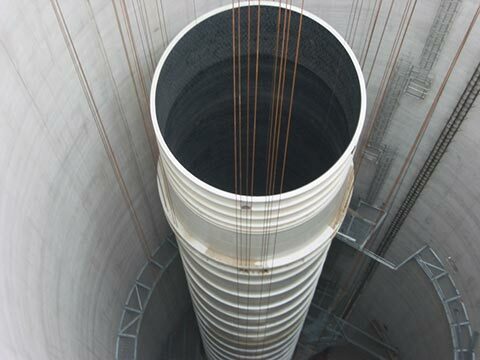 Tanjung Bin Power Station has a 200 m high reinforced concrete chimney with three, 7.5 m net diameter steel flues. To protect these flues against a very corrosive and variable operating regime, they were contructed with the PennguardTM Block Lining System applied over the full height of their internal steel surface. In total, the three chimeny flues use 13,037 m² of PennguardTM linings. 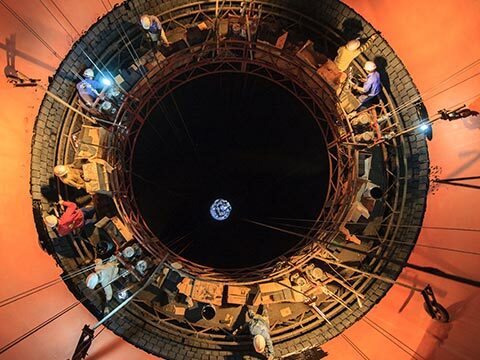 Balanced Engineering and Construction(BEC), the builders of the Tanjung Bin chimney, chose to install the PennguardTM linings in the three steel flues before their erection. 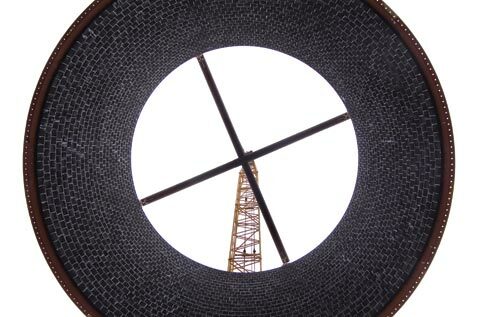 Here is a step-by-step overview of the flue erection and lining installation process. 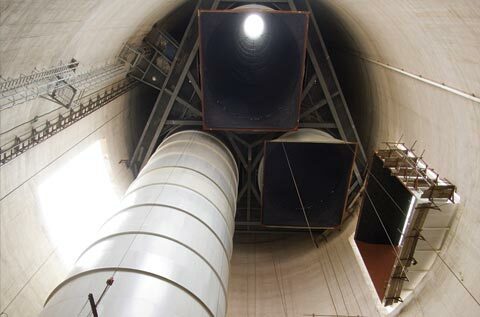 Flue sections, 7.58 metres diameter and mostly 6.00 metres high were prepared in a workshop and then transported to a place close to the chimney. A local crew then grit blasted, primer coated and PennguardTM lined each of these steel flue sections, prior to their installation in the chimney. Hadek inspectors performed a full, step-by-step Quality Assurance program on all lining activities. The steel was grit blasted to a “near-white” (SA 2 1/2) cleanliness, cleaned and then quickly coated with PennguardTM Block Primer. A close-up of the PennguardTM lining installation process. Once trained, an installer can typically apply 1.5 to 2.0 square metres of PennguardTM lining per hour. 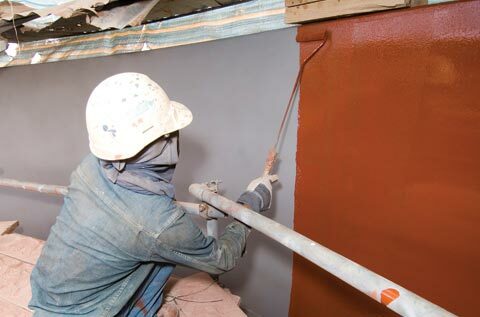 A typical crew of 6 installers requires the support of 3-4 workers to pre-mix PennguardTM Adhesive Membrane and to bring the lining materials to the workplace. 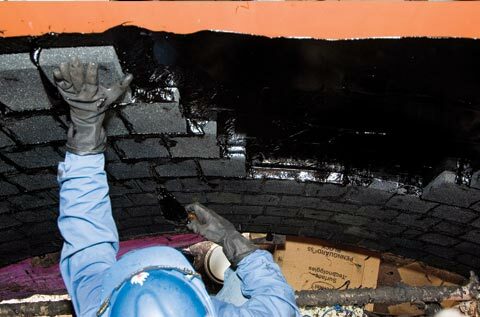 When the PennguardTM lining has been installed and cured, the lined flue section is carefully lifted and transported to the base of the chimney. The crew then carefully places the lined flue section onto the trolley that will bring it into the chimney. The lined flue section is attached to the chimney flue by bolted flanges. 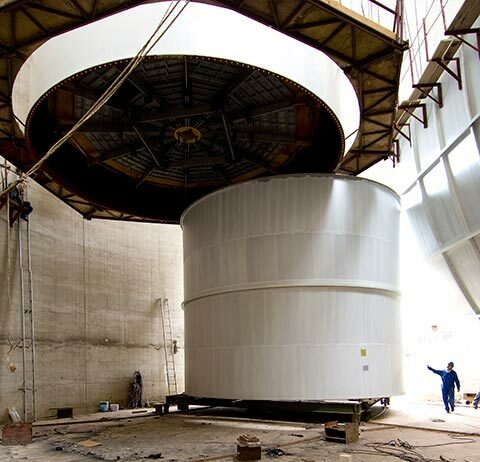 Once the flue section has been firmly bolted to the flue, the PennguardTM lining on the inside of the flange connection is completed, using the same installation method. Thanks to the flexibility of the 3 mm thick PennguardTM Adhesive Membrane backjoint, the flanged connection will remain gastight. When all pre-lined flue sections have been added, the steel flue reaches its full length and it is then hoisted to its final, top-hung position in the chimney. As the final step of flue construction, the steel elbow sections connecting the chimney flues to the FGD outlet ducts are then put in place. 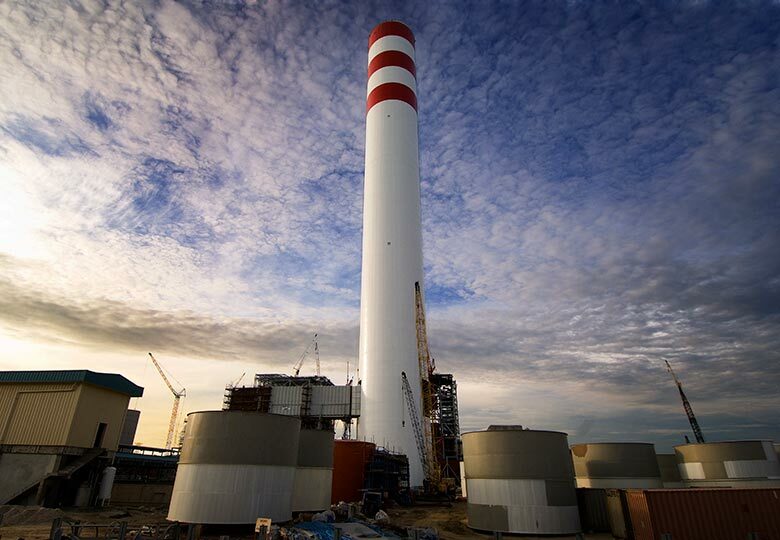 Owners and constructors worldwide need power station chimneys that will operate under low temperature, corrosive and sometimes variable conditions, In spite of their severe operating environment, these chimneys are expected to perform reliably for many years, with minimal downtime. More and more often, PennguardTM lined steel flues are selected as the most effective technology. 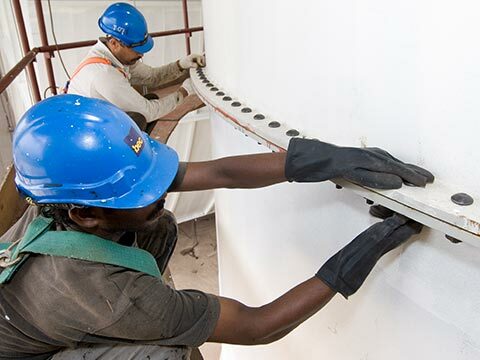 With the support of Hadek’s QA Inspectors, crews all over the world have succesfully installed PennguardTM linings in climates both hot and cold. A PennguardTM lining is at least 41 mm thick and it is tolerant of small weld and steel imperfections. It can easily be shaped around the design details. It has been designed for the reality of large construction projects. A proper installed PennguardTM lining offers a service life of well over 20 years. Just as importantly, it requires virtually no maintenance. 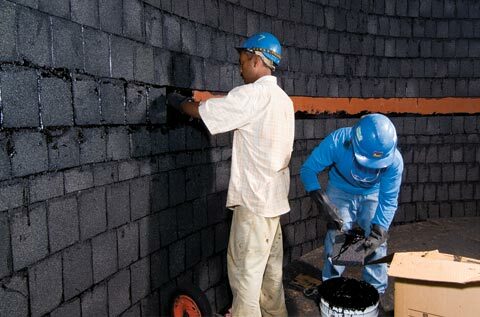 Any small repairs or alterations can be performed quickly, with minimum preperation and equipment. 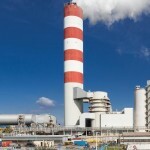 The availability of a PennguardTM lined chimney meets the same, high standard expected of all major plant components. Increasingly, large new power stations are designed not for one fuel and one operating mode, but for a range of different scenarios. The units of Tanjung Bin Power Station may operate with moderate or low sulphur coal, which will directly impact the use of the FGD system. A PennguardTM lined chimney is equally suitable for fully and partially FGD operation. Pennguard linings are also resistant to non-desulphurized gas flows. It allows its owner great flexibility in choosing his preferred operating mode.